Neroli comes from the bitter orange tree and originated in the Far East. Actually, Neroli is named after Anna Maria de La Tremoille, Princess of Nerola who first introduced the fragrance to Italy. She wore Neroli as a perfume and many other noble women followed the princess. 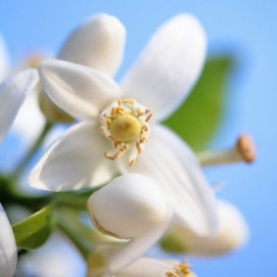 Neroli essential oil is known both as a sedative and overall tonic to the nervous system. It is very effective and beneficial for many stress-related issues dealing with the emotional body. It is also considered to be one of the most important essential oils in aromatherapy for treatment of anxiety, depression, shock and trauma. We import our Neroli Infused Jojoba from our South African distiller. According to our distiller, the Neroli flowers are delicately infused (using a very low heat process) into the Jojoba. Jojoba is not an oil, it is a wax, and its shelf life is indefinite, so there is no danger of this infusion turning rancid. Just like Neroli essential oil, the aroma of out Neroli Infused Jojoba is floral, sensual, sweet, and exotic.